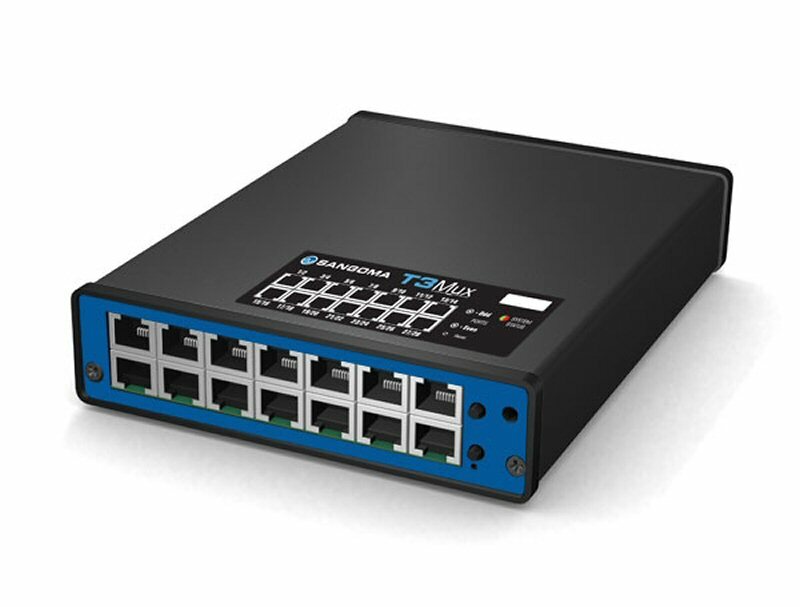 Sangoma Technologies Corporation (TSX VENTURE:STC), a leading provider of hardware and software components that enable or enhance IP Communications Systems for both voice and data, today announced that it has shipped the first unit of its newest product, the T3Mux. The T3Mux connects to a DS3 via a coaxial BNC connection from a Telco provider and grooms the signal to individual T1 circuits via 14 RJ-45 connectors with each connector carrying two circuits. This is directly compatible with the full line of Sangoma digital interface boards, including the A101, A102, A104 and A108. "The T3Mux was created in direct response to customer requests, particularly for use in large data centers and Telco operations," said Frederic Dickey, director of product management at Sangoma Technologies. "It allows a customer to order a DS3 interface from their provider, which is less expensive than ordering individual circuits when an implementation requires a significant number of T1s. It also makes the installation and maintenance easier and less costly as it simplifies cabling. Plus, the T3Mux is guaranteed to be interoperable with other Sangoma products that our customers are already using in their installations. This release demonstrates our commitment to be 'Not Just a Board Company Anymore' as Sangoma continues to sharpen the focus on product innovation to broaden our portfolio." While Sangoma now has the Vega Media Gateways from the acquisition announced two weeks ago, this is a significant release for Sangoma, because it is the first appliance-based product developed by the company. Sangoma plans about a dozen product releases, including a number of new appliances, over the next twelve months. Sangoma is a leading provider of hardware and software components that enable or enhance IP Communications Systems for both telecom and datacom applications. Enterprises, SMBs and Carriers in over 150 countries rely on Sangoma's technology as part of their mission critical infrastructures. Through its worldwide network of Distribution Partners, Sangoma delivers the industry's best engineered, highest quality products, some of which carry the industry's first lifetime warranty. The product line includes data and telecom boards for media and signal processing as well as gateway appliances and software. To view the photo associated with this release, please visit the following link: http://www.marketwire.com/library/20110913-T3Mux800.jpg.